The Grassroots MultiCultural Outreach Program (MCOP) is an effort to expand awareness and access to resources for the growing multicultural population in southwest Wisconsin. With more farms and small businesses hiring Hispanics and other new immigrants, MCOP was created to be the “first-of-its kind in our rural area” resource, referral and assistance program for new immigrants and their families. A VISTA worker has been hired through UW-Extension to assist in its implementation. This program is also supported in part by a grant from the Wisconsin Arts Board with funds from the State of Wisconsin and the National Endowment for the Arts. Join us and bring your friends! “Let’s Talk About Medicines” was the most recent bilingual workshop that MCOP helped facilitate. Held in Darlington, in cooperation with the Wisconsin Health Literacy organization, the workshop offered important tips to the young Hispanic mothers who attended, such as how to keep medicines safe, how to read labels and understand expiration dates, how to use an inhaler and getting refills when needed. Earlier in the year, MCOP worked with the Catholic MultiCultural Center in Madison, to bring an immigration attorney to Darlington and Richland Center. Special thanks to Sgt. Tony Ruesga in Darlington and Pedro and Becky Gomez in Richland Center for making the workshop arrangements. Attendees heard about the current status of immigration reform, and how people could prepare for new developments in advance. A lively and supportive discussion ensued. For individual immigration consultations for a reduced fee in Madison, Darlington or Montfort, participants can contact Attorney Ramona Natera, [email protected], 608-441-0114. MCOP JOINED THE FUN AT DARLINGTON’S FIESTA LATINA CELEBRATION Darlington’s annual Fiesta Latina celebration is one of the premier Latin fests in the region. 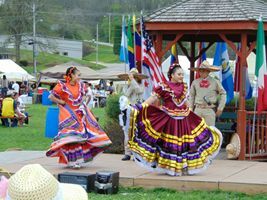 Families from as far away as Illinois and Iowa come to enjoy the delicious food, great entertainment, lots of Hispanic vendors and informational offerings, games for the kids and much camaraderie. This year, for the first time, MCOP staffed a booth, along with the Community Connections Free Clinic in Dodgeville, to reach out to the community. We provided bilingual information explaining our mission of solidarity and mutual support. Along with literature, we distributed special Mexican candies, which definitely added to the popularity of our booth! We were happy to greet old friends and new, and were able to increase awareness of our program and recruit potential ESL students, tutors and employers, as well as network with libraries and other organizations. MCOP BILINGUAL DIRECTORIES ARE UNDERWAY Thanks to a generous grant from the Platteville Community Fund for the Platteville area directory and to Alliant Energy Foundation for the Iowa County directory, MCOP is compiling bilingual Community Services Directories for Iowa and Grant Counties. A VERY SPECIAL THANKS to Janet Kolze and Bill Delaney who have worked tirelessly on the Iowa County Directory. These directories will be available online on the MCOP website (coming soon). There is no line for undocumented workers living in the U.S. They are not permitted to apply for residency except in special cases. Even for foreigners trying to enter legally, there are precious few green cards available. For example, the number of green cards available to low-skilled workers is limited to 5,000 per year for the entire United States. There is a limited lottery to obtain green cards that is available to people from countries with low rates of immigration to the U.S. such as Luxemburg or Belgium. But people from Mexico, China, India and the Philippines are not eligible. A U.S. citizen must wait 5 years to receive a green card for her minor child living in another country and 16 years for a married son or daughter. HOW YOU CAN RESPOND: It’s true that we are a nation of laws. But when laws are ill-considered, they must be changed. Slavery was once the law of the land and women were once forbidden to vote. Yet many people knew these laws were wrong and fought to change them. Today’s urgent challenge is our immigration laws. Our current policies are inhumane, ineffective and a major economic drain on our country. The problem is a mismatch between our outdated laws and the economic realities in the U.S. This mismatch has led to the ballooning of an unauthorized immigrant population and thousands of deaths at the border. The number of visas available to immigrant workers is miniscule compared to the demand for these workers by U.S. businesses. For example, in Wisconsin, the dairy industry depends heavily on immigrant workers because of their strong work ethic and dependability. In other areas of the country, highly-skilled foreign employees are in great demand by science and technology companies. Yet green cards are not available for them. According to a 2006 Pew Hispanic Center report, undocumented workers comprised 24 percent of all workers in farming, fishing and forestry and 14 percent in construction. The lack of a comprehensive solution has led to a population of 12 million unauthorized immigrants in the U.S. As a result, billions of Federal dollars are spent annually on border security and workplace enforcement. HOW YOU CAN RESPOND: To make our democracy work, all individuals must contribute fully to their community by voting, paying taxes, serving on town and county boards, serving in the military, and performing the many other tasks that are the responsibilities of citizens. For that reason, citizenship should be considered an obligation, not a gift. We should welcome as fellow citizens any immigrant who works hard enough to learn English and studies hard enough to pass the immigration test (which many Americans would have trouble passing). Immigrants are 30% more likely to start new businesses than native-born Americans. Every additional 100 foreign-born workers in science and technology is associated with an additional 262 jobs for Americans. Thanks to the labor of low-skill immigrants, the cost of food, homes and child care has come down and living standards have risen for Americans. Studies show that immigrants probably do not lower the wages for vulnerable, low-skill Americans. Immigrants are much less likely to wind up in prison or in mental hospitals than the native-born. Immigrants come here primarily to work and to join family members. According to the Urban Institute, their labor-force participation of 96% exceeds that of legal immigrants or native-born workers. Undocumented immigrants are not eligible for welfare, food stamps, Medicaid, and other government services. According to the U.S. Social Security Administration, 75% of undocumented workers pay payroll taxes and, overall, they contribute $7 billion in Social Security funds and $1.5 billion to Medicare that they will not be able to claim due to their status. Instead of draining social services such as education, healthcare, and unemployment compensation, undocumented workers actually save the country money by going to work immediately. Because our nation’s population is aging rapidly and birthrates are dropping, the younger workforce that immigrants provide is essential for our fiscal stability and continued economic growth. Effective immediately, Pres. Obama has ordered the Department of Homeland Security to stop deporting young undocumented immigrants brought here as children by their parents. These immigrants will also be allowed to apply for authorization to work. The change could affect as many as 800,000 individuals who have lived in fear of deportation. Form I-821D, Consideration of Deferred Action for Childhood Arrivals. Form I-765, Application for Employment Authorization. Information provided in this request is protected from disclosure to ICE and U.S. Customs and Border Protection (CBP) for the purposes of immigration enforcement proceedings unless the requestor meets the criteria for issuance of a Notice to Appear or a referral to ICE under the criteria set forth in USCIS’s Notice to Appear guidance (www.uscis.gov/NTA). The information may be shared with national security and law enforcement agencies, including ICE and CBP, for purposes other than removal. The confidentiality provision also covers family members and guardians. Form I-765 and Form I-765 Worksheet for employment authorization must accompany form I-821D, and the total fee is $465, including the cost of biometrics. Information about the forms and links to the forms can be found on this page of the USCIS Web site. Once forms and fee are received by USCIS, the agency will send a receipt notice and will send notice for a biometrics appointment at a USCIS Application Support Center. Processing will take several months, depending on how many individuals request deferred action. Contact your legislators and let them know your views, click here for contact Info. To stay on top of fast-moving developments in the area of national and state Immigration policy and legislation, please join our Grassroots Immigration Study Group. We study immigration policy throughout the country and are planning local forums (date and time to be announced). CONTACT: Earl Barnes, [email protected] or (608)623-2109. We have created events to educate and achieve a better understanding of immigration issues in our area. In cooperation with the Community Connections Free Clinic, Iowa County Literary Council and Plymouth Congregational (UCC) Church, we have started an English-as-a-Second Language tutoring program. Read about how it is going in this Dodgeville Chronicle article. A day-long Rural Immigration Summit in conjunction with UW-Extension to discuss the complexities of today's immigration issues from a local point of view. Presentations by experts in the field and a panel discussion were followed by group discussions among audience members. An Evening with David Giffey in which Giffey discussed his photo exhibit on migrant farm workers in Wisconsin and shared his perspective on immigration. For more information about specific events or activities please contact: Earl Barnes, [email protected] or (608)623-2109.